The latest sales report for the United States Mint’s numismatic products shows a rebound for most gold and platinum products. The one ounce 2012-dated American Gold Eagle and American Gold Buffalo coins were all higher compared to the prior week, as was the one ounce 2012 American Platinum Eagle. The 2012-W Uncirculated Gold Eagle showed the strongest gains, selling 113 units this week compared to just 6 coins in the prior week. The individual one ounce 2012-W Proof Gold Eagle sold 137 units this week compared to 81 units in the prior week. 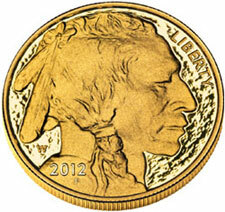 The 2012-W Proof Gold Buffalo sold 145 units compared to 106 in the prior week. Year to date sales have now reached 15,906. The lowest final mintage for a one ounce proof coin of the series is 18,863 for 2008. Recently, there have been indications that the US Mint is considering a special anniversary set to be issued in 2013. Weekly sales of the 2012 Proof Platinum Eagle were 27 units, bringing total sales to 6,572 out of the 15,000 maximum mintage. It was recently confirmed that the US Mint would not issue platinum bullion coins for 2012, making this proof coin the only American Platinum Eagle issues for the year. Hope the best to you do to weather, brought tears to my eyes when I seen all the support utility trucks and good men and women headen your way from my area of the heartland of America. From my family to yours wish you all the best and prayers will be for you. These reports ROCK ! Thank You Michael ! I think we will all be fine Goat !!! Thanks to those who went the distance !!! Used to be, in the ancient past, the Mint only made one annual proof set and one uncirculated coin set from each mint. It used to be that the Mint sold coins only within the year of issue. You can buy 2011 and 2012 coins now. I think I’ll wait until 2019 to buy the whole set of 5 oz. ATBs all at once directly from the Mint.